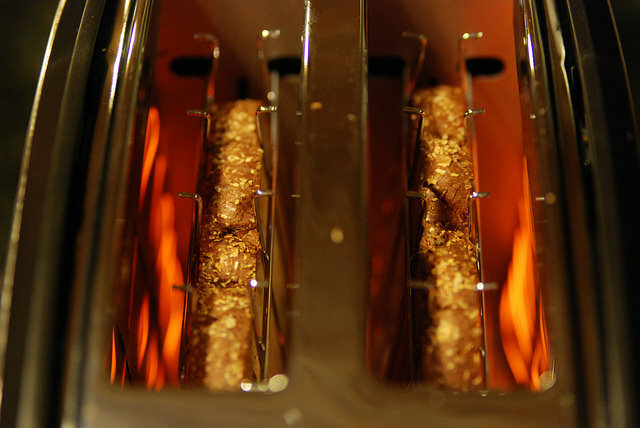 Toasters: An Invention, or A Wonder of the Modern World? Or maybe just wizardry? You be the judge! But either way, it’ll work for this week’s assignment if you want to talk about toasters. Hey everyone! Here’s the homework assignment for my intensive class. As usual, everyone is welcome to participate. This week you have the choice of three assignments. Well, it’s really one assignment, but you have three directions you can take it. Just choose one, not all three. Since we were talking about Helen Keller, you can do some research on a famous person. We were also talking about inventions, so you can research an invention you’re interested in. And finally, we were talking about “Ancient and Modern Wonders of the World,” so you can also research one of the wonders in the book (or find a different thing you think is a wonder). 1. A general summary of the information you found in your own words. DO NOT just copy and paste information from Wikipedia or any other site, or I will hire an accordion player to come to your house at 3 am and play Celine Dion songs outside your window! 2. In your summary, include at least 10 phrases or sentences (one sentence can have more than one) in the passive voice. It can be in any tense, but make sure it’s in passive voice. 3. Links to at least two sites that you used to find information. Tell me if you have any questions. Good luck! I decided to write about a invention I saw like 2 years ago, this training bees that are latching to a machine that have cells ..and are use to find drugs when a bee is released,also explosive materials will be found by that type of insects too. the name of the Technics that are use to train this two kinds of insects (wasps and bees)to find different substances is Hymenoptera training, basically this two kinds of insects can be training to find drugs,because of the sensitivity of their olfactory senses, almost like a sniffer dog. Hymenoptera was discovered in 2001.
also this machines has been useful ,because they can put at list 30 bees inside of the cells.They said that in a few years this machines will be used in airports and those kind of places that can be used for the narcotraffic, also the cells of the machines has been improved to make them more efficient. so most of the next cases will be done by this new technology and receiving help by different organs that are in pro of this new ideas. …………so this all , i hope that new inventions and researches that are been made by different company’s still resolving all this problems we have in the society …….. because as we know,this world is gonna be saved by us……maybe :s ( yes that in the end is a excuse for the lack of ideas that I have right now haha). Wait, who’s the nerd and why? Otherwise, interesting topic. Just be sure to double- and triple-check your sentences to make sure that you start with a capital letter, end with a period, don’t have plural nouns with singular verbs, etc. So the info is good, just work a bit on the mechanics. Anyhow, welcome, and hopefully you’ll also do the other assignments! I decided to talk about a famous person, so I chose Mother Teresa of Calcutta. As you know, she was a wonderful person, who always helped people that didn’t have a place to live, or who were suffering from any kind of illness. Mother Teresa was born on 26 August, 1910 in Macedonia. Her father had died when she was only eight years old, but she didn’t give up, she was a strong girl and she could overcome her and father’s dead, or that’s what I think. Despite of growing up without a father, she was a religious person, like her mother. Mother Teresa left her home in 1928 to join the Institute of the Blessed Virgin Mary, known as the Sister of Loreto, in Ireland. In 1931, Mother Teresa was assigned to the Loreto Entally community in Calcutta and taught at St. Mary’s School for girls. She was teaching at St.Mary’s School for several years, and for that reason she had become the shcool’s principal. Also, she was a person of profound prayer and deep love for her religious sisters and her students. Mother Teresa travelled across the world from the late 1980s through to 1990s. She was opening of new houses, and servicing to the poor and disaster-stricken. New communities were founded in South Africa, Albania, Cuba, and war torn Iraq, She travelled to many countries, even when she was in a weak state of health. On 5 September, Mother Teresa died at the Motherhouse. Her body was transferred to St Thomas’s Church, next to the Loreto convent where she had first arrived nearly 69 years earlier. Hundreds of thousands of people from all classes and all religions, from India and abroad, paid their respects. Although Mother Teresa died many years ago, she hasn’t been forgotten by many people and also, she has become a role model for others. Great work! I only noticed a few small errors, but nothing that made it harder to understand. The only one I’d mention is “dead” is an adjective, and “death” is the noun. Looks like you edited it and added more–nice! The pyramids were built thousands of years ago by the Egyptians, they are my favorite antiquity, they are not only because they can be visited, also for the mystery that is around this contruction, which according to archaeologists was made by the people of the ancient era, but this is not fully demonstrated. I prefer the theory of ancient aliens created by the History Channel , this theory says that the contruction of the pyramids was directed by aliens which were in the earth at that time. I personally find it very suspicious that the pyramids was constructed by slaves, The order of the pharaohs were made it and is more difficult to believe they were constructed in 20 years by slaves. I will be really focused to find new pyramids built by aliens under the sand and demonstrate the theory. Another curious fact is that there are many pyramids not only in Egypt, also were built in China, Italy and Bosnia. the pyramids in these countries are hidden by governments. Good use of the passive voice! Just look out for punctuation and capitalizing the first letter of each sentence, and that’ll make your sentences look cleaner and clearer. Battery was one of the most useful intention and It facilitated major electrical advances. The battery was discovered by two big scientific Luigi Galvani and Alessandro Volta. First, The Simple circuit was discovered by Galvani. Luigi Galvani was working at Bologna University.When He was dissecting a frog affixed to a brass hook. When, Galvani touched its leg with his iron scalpel, the leg twitches. He believed the energy that drove this contraction came from the leg itself, and called it “animal electricity”. Volta was a friend of Galvani. Volta was prompted by these experiments. So, He decided to made different series of experiments using metals positives and negatives. Volta discovered in 1800 that certain fluids would generate a continuous flow of electrical power. This discovery led to the invention of the first voltaic cell, more commonly known as the battery. Gaston Planté invented the first rechargeable battery a system that is still used today. It was invented in 1859. Even to this day we still use the battery as a tool indispensable. Good job. And it’s nice to know that modern batteries don’t need dead frogs to work effectively. Making a hard researching in a lot of sites in the net (see the link in the end of the post) I decide to research about Modern Wonders in the world. Focus on the greatest civil engineering achievements of the 20th century!! And the second one, I know you never thought in that one. It’s about a building not to much known in the world, called Empire State Building jaja. It is located in a city of US called New York, specifically in Manhattan. It is considered the most important building in NY, but it is not the tallest, it was the tallest from 1931 to 1970. The Empire State was built in 14 months and designed by William F. Lamb. It has be used by many people to suicide and in 1954 it was crashed by a plane. It is an amazing building. Very cool! You probably don’t want to hear this, but I’ve been to the Golden Gate Bridge AND the Empire State Building. Both were really cool. I also went to the World Trade Center in 2001 when it still existed, which was also a great experience. Just be patient. You’ll get there one day. I to talk about famous person. He is Nick Vuychich, I Choose he, because I think that despite the disability, that he has, he is an exemplary man and a successful life. He was born on December 4, 1895 in Brisbane, Australia. He was born without legs and arms, he has the Syndrome Tretra-amelia. During his childhood he had depression because his classmates teased their appearance. When he was 8 years, he attended to suicide and 10 years he attended to drown in the bathtub. After a time to pray to God for his arms and legs grow, he felt grateful for his life and he thought that his life could help others people. He studied accounting and financia planning. He started giving motivational talks. In 2005 he founded an institution called “Life without Limbs”. In 2008 he filmed his own documentary called ” Born without Limbs”. Nick is very happy now, he love his life. Nick is married with Kanae Miyahara and they have a baby, his name is Kiyoshi Vujicic. He says that if a person falls must rise, but if don’t have forces and hopes, they must to try and try again until to manage to do. In my opinion is a excelent way to see that own life is wonderful and we have many opportunities for rise every day so we never give up. Good job–I know I’d heard about Nick before, but I can’t remember where. In any case, he’s very inspiring and his story is incredible. One note: he attempted suicide. “Attend” means to go to something, like my students attend class, where I take attendance (the list where it says who was in class and who wasn’t). I choose one of the most important soccer player of 80s and 90s, but I think that is better he will be considered as one of the most important sportman in whole the world, a person capable of making many people consider him as a god. Diego Armando Maradona Franco was born in October 30, 1960. He is a former Argentine footballer. He has been served as a manager and coach at other clubs as well as for the national team of Argentina. Many experts, football critics, former players, current players and football fans regard Maradona as the best football player of all time. He was joint FIFA Player of the 20th Century with Pelé. earned 91 caps and scored 34 goals. Four FIFA World Cups were played by Maradona, including the 1986 World Cup where he captained Argentina and led them to victory over West Germany in the final, and where the Golden Ball award was won by him, converting it as the tournament’s best player. In the 1986 World Cup quarter final, he scored both goals in a 2–1 victory over England that entered football history, though for two different reasons. The first goal was an unpenalized handling foul known as the “Hand of God”, while the second goal followed a 60 m (66 yd) dribble past five England players, voted “The Goal of the Century” by FIFA.com voters in 2002. Good, although at least one of those paragraphs was copied and pasted… don’t make me kick a soccer ball at you. Hey Ryan I decided to chose the famous football player Andrea Pirlo and his awesome carrer. is usually deployed as a deep-lying playmaker in midfield for both Juventus and Italy. He has play in many teams like Brescia, Internazionale, Milan and most important and the team that won´t be anything without him, the Juventus like I say it before. He has been called to play with the national team of Italy for 113 games and he has participate in soo many cups that you can even remember them, but I can say a few like 2006 World Cup, Euro 2012, 2013 Confederations Cup, 2014 World Cup and soo many others. Some of these cups that he has played has been won by this crack of the football. There are no words to describe him and who he plays, but in one word could be AWESOME. I tried to respond to this but had an internet problem. It looks good, but be sure to get the past participles correct. Also, this was actually for the other class, but you’re still welcome to comment on it, of course!